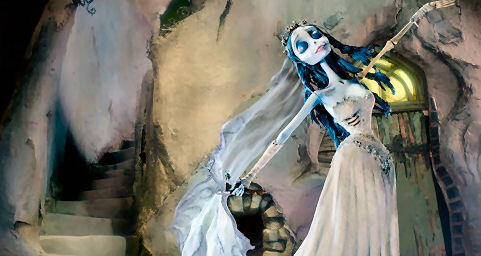 Andrea's Random Lil' Blog: Animation - "Corpse Bride"
We watched Corpse Bride last night and it is a gorgeous little film. 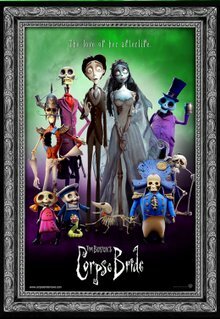 I love the way Tim Burton has turned "death" into something cute. The characters are so likeable and human, and I think it's great for kids so they can be a bit more understanding of death, maybe. Even us, grown-ups, are not so understanding, but this film lightens up such a gloomy and scary theme. Somehow. The soundtrack by Danny Elfman is also remarkable, especially the piano solos played by Victor and Emily, and the musical pieces taking place in the world "below", very funny and well-choreographed. 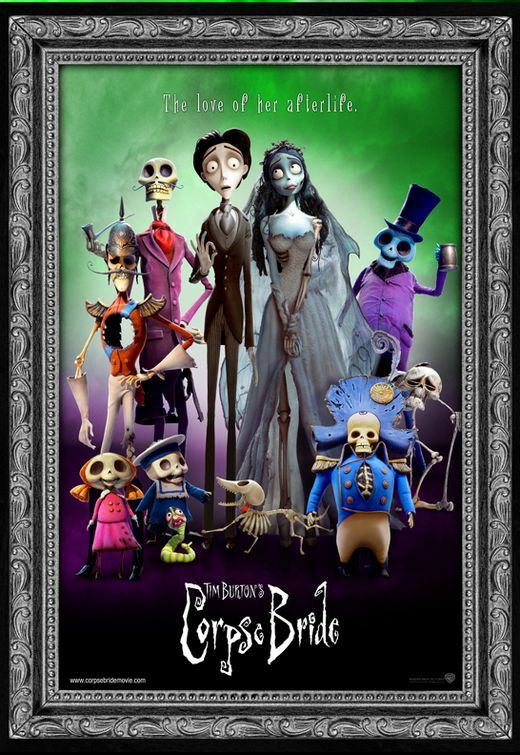 It is also cool to see the contrast between the rigid, grey real-life world and the bright colourfulness of the world of the Dead. As if the Dead guys were the ones "released" whereas their "alive" counterparts are those restrained to a colourless, almost monochrome existence. The characters of the brides (Victoria and Emily) are brilliantly voiced-over by Helena Bonham-Carter and Emily Watson, who bring emotion and grace to their roles. Victor, as one may expect from Burton, is of course Johnny Depp - also impeccable as the very Brit and shy groom-to-be Victor Van Dort. Needless to say the animation is superb, and those characters are so pretty (well, the good ones at least!) that you end up by falling in love with them. They have big, soulful eyes and the expressions are perfect, as well as their movements. They seem to float effortlessly and you detect no stiffness or harsh moves at all. Lightly and gracefully. Beautiful indeed. My favourite characters are the brides of course, and also the corpse-dog Scraps - who used to belong to Victor when he was a little boy. The plot is not only simple (no unnecessary frills here), but very clever and funny, something to be enjoyed by both adults and kids. Manga to Love - "Death Note"